Windsong & Requiem - Of a Great Deep by Chad Hunter - Book Tour - Book Trailer - Guest Post - Giveaway - Enter Daily! Hello lovelies! It gives me great pleasure today to host Chad Hunter and his new book, “Windsong & Requiem - Of a Great Deep”! For other stops on his Goddess Fish Promotions Book Tour, please click on the banner above or any of the images in this post – except the Available at Amazon picture. Be sure to make it to the end of this post to enter to win a $20 Amazon or Barnes and Noble Gift Card!! Also, come back daily to interact with Chad and to increase your chances of winning! The year is 1716. The world is in the Golden Age of Piracy and fabled ships sail the seven seas. One such vessel is the Requiem, captained by the young but wise, brave but dubious Nabopolassar “Bo” Travis. Alongside his first mate Ghassan, quartermaster Winter Burke and navigator Glover, Travis seeks treasure, female company and good drink. The Requiem’s legendary adventures are filled with tales of monsters and myths - all of which are true. Now, someone or something is sailing the seas in search for a treasure chest – a chest that holds unknown riches which only promise to change the world forever. Captain Travis, his crew and a beautiful young map reader must brave the dark and the deep to find the treasure. Will the Requiem find the X on the spot before the infamous Captain George “Bloody-Face” Fiddick does? Will Travis uncover the secret behind the cursed black ship which changed his young life forever? And will the treasure chest truly be full of riches or does something far more insidious lie in wait? Ready your flintlock. Sharpen your sword. The Requiem awaits. Lights flickered. The wind would regularly wheeze its way in enough to play with the candles that kept the hidden lair bright enough for reading, for planning and mainly enough to keep George Fiddick's men from walking off cliffs and cavernous drops. George Fiddick or George "Bloody Face" Fiddick as he had come to be known, sat on a chair that was long since stolen from some ship long since raided and sunk. The tomes and books, art and items that filled the room in heaps here and there were also all pieced together from adventures on the seas long ago. No particular details rang clear in Fiddick's mind. Everything seemed to lump together. And that was life now for the aging man more so than the exactness of details remembered in his younger days. A mountain of a man, Fiddick filled the whole chair as he leaned back into it. The wood and upholstery of the pirate's throne groaned under his size. His brown coat and dark pants matched the massive beard that covered his chin. The hair on his face was still smooth and wavy and mostly dark, unlike the thinning and graying hair atop his head. Of all the colors that comprised Fiddick, most focused on the red that regularly gushed from his nose. It darkened on the handkerchief in his bear-claw hand. It was not battle wounds and swords slicked in crimson that had earned him his moniker. "Bloody Face" was pejorative and it stuck. Now Fiddick let it be what it was - a terrifying legend to all who sailed. When captains and crews, privateers or navy saw the Crimson Lady, it was unmistakable. The mighty ship ruled seas and oceans with her black flags each with a red insignia shaped of a Great Deep woman. “Look alive, ye old salt dogs!” Or better yet, allow me to greet you with hello and invite you aboard the Requiem, the finest ship to ever sail, at least according to her fiery captain Bo Travis and his loyal crew. 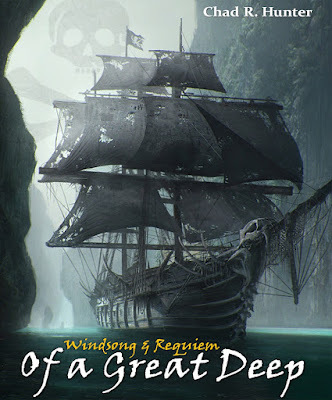 While the literary world may be abundant with pirate fiction, there is only one “Windsong & Requiem – Of a Great Deep!” Here are five reasons why you want to hoist sails, pull up anchor and set off to the horizon with this novel! 1. Amazing characters – The crew of the Requiem will come to life in your very hands. These are no generic eye-patched, peg-legged characters. They will move you, frighten you and have readers invested in their final fates. You will find yourself wrapped up in the lives of the Requiem’s crew from the navigator Glover to Winter Burke to first mate Ghassan and especially the ne’er-do-well Captain Travis. In addition to the Requiem’s crew, the supporting cast is equally as real from the aged pirate George “Bloody Face” Fiddick to the mournful but brave Jamilah and others. “Of a Great Deep” will give you friends…and enemies…for life. 2. Exciting plot – There have been pirate tales of great concept but convoluted storylines. “Of a Great Deep” is a tight ship (if you’ll excuse the pun!) From beginning to middle to end, readers will be bound to turning the next page. There are pirates. There is treasure. There are monsters. As the author of the novel, I pride myself on weaving storylines that seem completely unrelated until the very end when it all comes together. The reader is owed that much. 3. It will take you there and back – “Epic” - That is the word that many have used after reading “Of a Great Deep.” Readers have stated that they felt as if they were on board every ship, in adventure and swinging swords in every fight in the book. The plot, the action, the characters and the themes will strike a chord with you somewhere, someway and you will find yourself feeling as if a great trip has been undertaken and you stowed away for it. 4. It’s good – Since we lived in caves, since we gathered around fires, since we dared the horizon of the seas and the flatness of the world, humanity has longed for good stories. A well told tale has enraptured us, captured us and inspired us. Captain Bo Travis’ adventure will do all of that and more because, in the end, it is a good story and it is told well. Don’t take my word for it (although I swear on pistols crossed and swords.) Pick up a copy and find out for yourself. 5. You will feel free again – As we have romanticized them today, pirates’ main draw is the feeling of freedom. They represent independence, the ability to decide one’s own fate, one’s own middle and end with either razor precision or reckless abandon. We lack this in today’s world and if we can find that particular flavor again, we will feel as if breathing for the first time. “Windsong & Requiem – Of a Great Deep” will give you the chance to feel that freedom. Sailing aboard the Requiem or the Crimson Lady as captain or crew will invigorate you more than another meeting at work. Crossing swords against the watery undead or in conflict with opposing pirates will thrill you far beyond one more recital or carpool. Forget the price of gas – you have sails and the wind. Enough of political debates – you move under your own flag – and it is black with white skull and bones. “Of a Great Deep” will remind you of the freedom resting down inside you. Chad Hunter was born in East Chicago, Indiana. Raised by a single mother in the city's Harbor section, he is the youngest of four. Growing up in the Midwest and a proudly self-proclaimed "Region Rat," Hunter has written and published several books and novels. He has written for magazines and newspapers throughout North America and has been published in several languages. His writings have been called sophisticated yet humorous, sharp witted and unrelenting. Most often, Hunter's writings have been considered so wide and diverse that they span a scale that would include multiple writers with multiple forms. In addition to being a published author and journalist, Hunter is also a professional speaker. Having presented to high schools, colleges and various other audiences, his talks and discussions center around the positive impact of literary and creative presences in one’s life. A large portion of Hunter’s focus is on the uncanny strength of human connectedness which is emphasized via the lens of writing and creativity. Working in genres including dark fantasy, memoirs, science-fiction and anecdotal collections, Hunter weaves tales of monsters, heroes, zombies, wedding planning, technology, pirates and even black parakeets. With over ten books under his belt, If anything binds his varied styles, it is Hunter's theme of the human condition, humor and family closeness - all to the backdrop of romantic love, vibrant remembrance and even monsters themselves. Chad will be awarding a $20 Amazon or B/N GC to a randomly drawn winner via Rafflecopter during the tour. 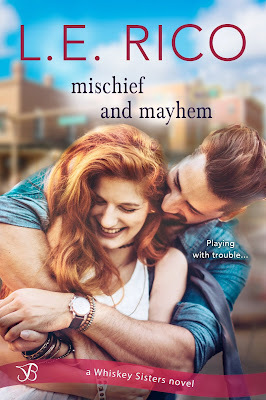 Mischief and Mayhem by L.E. Rico - Blurb Blitz - Giveaway - Enter Daily! Hi lovelies! It gives me great pleasure today to host L.E. Rico and her new book, “Mischief and Mayhem”! For other stops on her Goddess Fish Promotions Book Tour, please click on the banner above or any of the images in this post. Be sure to make it to the end of this post to enter to win a $15 Amazon or Barnes and Noble Gift Card!! Also, come back daily to interact with L.E. and to increase your chances of winning! Holy hell! What was that? I try to appear composed, even as I feel the two hot, red spots that are forming on my cheeks. He chivalrously turns to leave before I’m in full-on beet mode, but not before I catch a little color on his face, too. L.E. Rico didn’t set out to be an author. In fact she’s made a name for herself as a classical music radio host—doing her best to make the music and the composers relevant by putting them into a modern context. 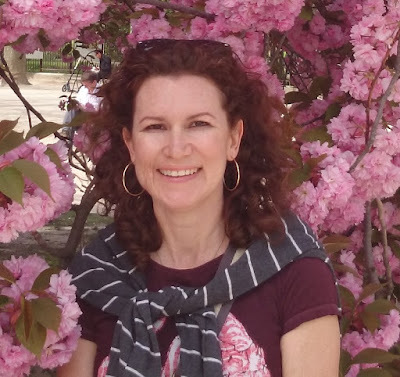 It was just a few years ago that she discovered a passion for writing that blossomed into an entire novel. And then another. And another. And, while she still spends plenty of time on the radio, telling the stories of the great composers, she spends even more time composing her own great stories. L.E. will be awarding a $15 Amazon or B/N GC to a randomly drawn winner via Rafflecopter during the tour. Lost Until You by Kimberly Daniels - Book Tour - Guest Post - Giveaway - Enter Daily! Hi lovelies! It gives me great pleasure today to host Kimberly Daniels and her new book, “Lost Until You”! For other stops on her Goddess Fish Promotions Book Tour, please click on the banner above or any of the images in this post. Be sure to make it to the end of this post to enter to win a $25 Amazon or Barnes and Noble Gift Card!! Also, come back daily to interact with Kimberly and to increase your chances of winning! Struggling against growing feelings for Cole, Camryn tries to focus on life with her son. But when Cole picks the lock to her heart, Camryn knows he might be the one to change everything. Just when Camryn thinks she's finally finding her happiness, a ghost from the past comes back to haunt her. Camryn must now decide between letting Cole stand with her in the fight for her life, or staying lost in the pain of the past. The walk home is spent talking about the normal things: work, surfing, summer plans. As we approach the end of our walk, three crazy people waving and yelling our names block the entrance to our houses. Gavin bolts toward us, jumps into Cole’s arms, and reaches one arm out for me to pull me in for a group hug. The change in his demeanor from yesterday is astounding, and I know the sight of Cole and me together is part of that. Surely Carter also helped by pumping him with junk food all night at their sleepover. Lila and Carter join the hug seconds later, making me feel like I can call this home again. We break apart from our embrace with Lila begging for the scoop, Carter complaining of hunger, and Gavin bragging about winning his bet with Cole. Before I can answer anyone, Cole puts his arm around me and looks at Gavin. “Aww, thanks, buddy.” Cole reaches his fist up to Gavin. Watching the two of them interact like this creates a feeling of contentment and satisfaction that is so new and refreshing. Everyone starts walking toward the back deck while I take one more look out toward the vast stretch of sand. This beach town holds the reason for my nightmares and heartache. But today, it represents the birth of my new life, one that includes Cole. However, looking toward the water’s edge, my elation is quickly stripped from me as I stand staring into the aqua-colored eyes of my biggest fear. My third-grade teacher, Mrs. Birch, gave me my first taste of being an author when she chose my short story to “publish” in the school library. That excitement I felt stuck with me as I continued through the school years. English quickly became my favorite subject, especially in seventh grade when I read The Outsiders by S.E. Hinton. That book began my love for reading and it also inspired me to one day write one of my own. 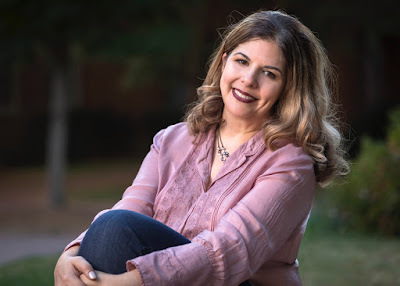 In addition to taking on this new title of author, I teach Middle School English and that excitement still is so apparent when I read certain novels with my students or teach them different aspects of writing. Five years ago, I showed my co-teacher, who is also a freelance editor, a few chapters of a story I was writing. She pushed me to finish the story, becoming my very first beta reader and editor. Since then, I really haven’t looked back and I continue writing the stories that seem to swim around in my head constantly. Currently, I am writing the second story in the Finding You Series which continues where Lost Until You ends. Cole’s story is more prominent in the sequel, especially the pain of his past. An yet again, that excitement I first felt in third grade continues to swirl through me when I write. Kimberly will be awarding a $25 Amazon or B/N GC to a randomly drawn winner via Rafflecopter during the tour. 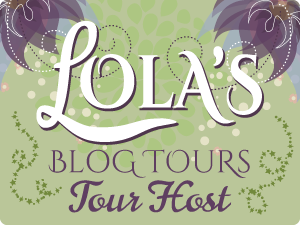 Shadows and Silk Series (Three Lessons in Seduction/Tempted by the Viscount) by Sofie Darling - Double Book Tour - Guest Post - Review - Giveaway - Enter Daily! Hello lovelies! It gives me great pleasure today to host Sofie Darling and her new book series, “Shadows and Silk Series”! For other stops on her Goddess Fish Promotions Book Tour, please click on the banner above or any of the images in this post. Be sure to make it to the end of this post to enter to win a $25 Amazon or Barnes and Noble Gift Card!! Also, come back daily to interact with Sofie and to increase your chances of winning! Lord Nicholas Asquith needs his wife. Too bad he broke her heart ten years ago. Mariana spent the last decade forgetting Nick. Now she has the chance to best him at his own game, an opportunity she can’t resist, even as her view of him begins to shift. Increasingly, she wants nothing more than to seduce her own husband . . .
It’s only a matter of time before mad passion ignites, a passion never convincingly extinguished. A passion that insists on surrendering to the yearning of the flesh and, quite possibly, of the heart. What Olivia doesn’t anticipate is the temptation of the viscount. The undeniable spark of awareness that races between them subverts her vow to leave love behind. Soon, she has no choice but to rid her system of Jake by surrendering to her craving for a single scorching encounter. “A Woolly Mammoth in London?” he asked with a confounded laugh. In fact, she was disappointed to have missed it on this trip. But Nick needn’t know that. She’d revealed too much about her life already. Mariana’s traitorous insides went light at his words and at the implication within them. The moment could grow soft, and a sense of ease could steal in, if she allowed it. It was an ease she’d felt the first time they’d locked eyes at a dinner party at Uncle Bertie’s country estate—so very long ago. She’d felt they were two halves of the same whole and had been waiting all their lives to be joined together. She gave herself a mental shake. Such memories were a trap. Over the last decade, she’d done quite well forgetting what she liked about her husband. She wouldn’t allow softness to shake her resolve. This was Nick. He was as soft as a razorblade. 1. Historical, not a history lesson! First off, Tempted by the Viscount is a historical romance, but that doesn’t mean it has to be a boring history lesson. For me, that’s the beauty of this genre. It has the ability to transport the reader to a different time and place in a way that’s fun and engaging. For example, the hero, the newly minted Right Honorable Jakob Radclyffe, Fifth Viscount St. Alban, has spent his career as a ship captain and has just returned from the Far East to claim the viscountcy. That sentence alone has three different areas that call for research—19th-century shipping, 19th-century Japan, 19th-century English inheritance laws—but the history isn’t the point of the story, the romance is! So the idea is to weave the history in and create a world without it becoming the focus. I can tell you, there are a lot of scraps of history on my cutting room floor. 3. Steamy! Do you like your romance with a lot of heat? Jake and Olivia have a lot of trouble resisting the temptation of each other. In fact, they fail at it . . . ahem . . . often. 4. Love wins! In their youths, Jake and Olivia were each burned by love. Over the course of the story, and as they get to know each other, they have to decide if they can overcome the damage of the past and risk their hearts a second time with each other. This is what’s at the heart of romance: it can have mystery, intrigues, and thrills, but in the end, it’s all about the love. Thank you so much for having me today. This was fun! Sofie will be awarding a $25 Amazon or B/N GC to a randomly drawn winner via Rafflecopter during the tour.